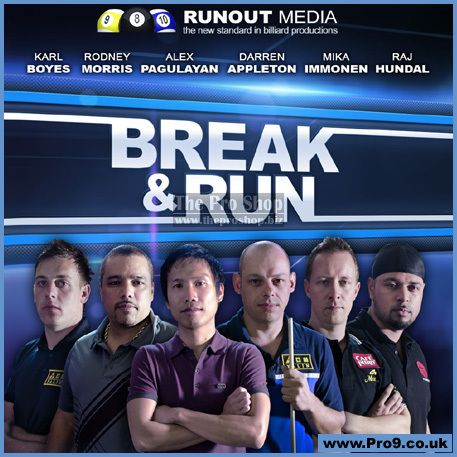 RUNOUT MEDIA is proud to announce BREAK & RUN, a 3-disc instructional box-set geared towards advanced and expert level players. 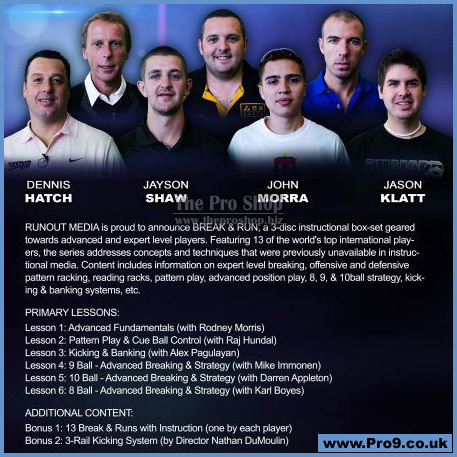 Featuring 13 of the world's top international players, the series addresses concepts and techniques that were previously unavailable in instructional media. Content includes information on expert level breaking, offensive and defensive pattern racking, reading racks, pattern play, advanced position play, 8, 9, & 10ball strategy, kicking & banking systems, etc. Staring Alex Pagulayan, Darren Appleton, Mika Immonen, Karl Boyes, Rodney Morris, Raj Hundal, Earl Strickland, Chris Melling, Donny Mills, Jayson Shaw, Dennis Hatch, John Morra, and Jason Klatt. With a cumulative 11 World Championships and 11 US Open titles, there is no better group of players from whom to learn.